Samuel Johnson fought back tears following his performance. Source: Channel 10/Ten Play. 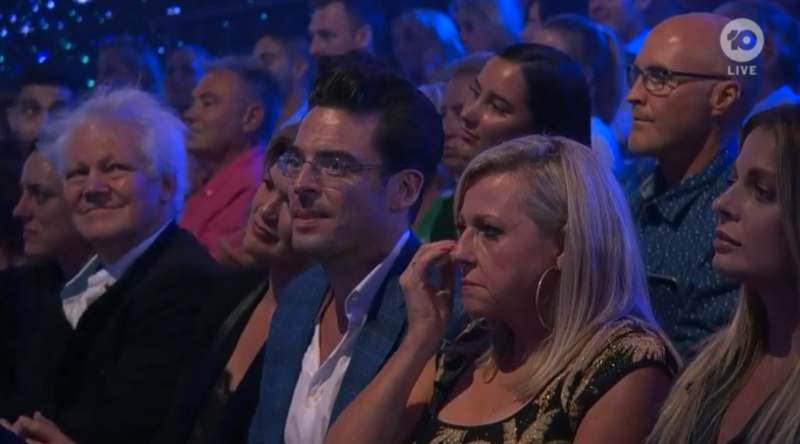 An emotional Samuel Johnson left the Dancing With The Stars crowd and host Amanda Keller in tears after performing a deeply moving tribute performance for his late sister on Monday night’s show. The actor, 41, sadly lost his sister Connie in 2017 following her battle with breast cancer and he devoted his dance on the show to their entire lives together. The judges were all impressed by the tribute dance, with each sharing their admiration for his bravery. The Secret Life of Us actor revealed his inspiration for the performance earlier in the show, saying on camera: “My memorable year is 2017, the year I lost my sister. Angela Bishop was seen wiping away tears in the crowd. Source: Channel 10/Ten Play. “She left this extraordinary legacy for the country. It’s not the cancer that’s making me crying it’s all she did for me. The biggest thing she taught me is that now is awesome and to insist on joy. Before Connie’s death at the age of 40, her and her famous brother set up charity Love Your Sister to raise money in the fight against cancer. Meanwhile later in the show, Studio 10 star Denise Scott was sadly voted out of the competition with all of her fellow panelists cheering her on from the crowd. “I love this man Jeremy, he’s beautiful… Not only a beautiful dancer, a beautiful soul,” she said of her professional dance partner. “I’ve had the pleasure of working not only with him but his beautiful wife Sarah, their kids, our producer. It’s been a blast, but you know I’m tired… No I’m serious. Are you a fan of the show? What did you think of all the stars’ latest performances?